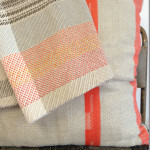 Catarina Riccabona is a London-based textile designer / weaver. Originally from Austria she came to London to work in publishing, but after some time decided to change her career. She did a Foundation Course at Chelsea College of Art and Design followed by a BA (Hons) in Textile Design at Central Saint Martins where she specialised in woven textiles. 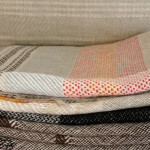 Catarina started her own textile design business upon joining Cockpit Arts in May 2012. 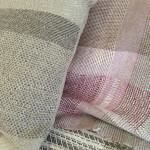 She is also a recipient of the Cockpit Arts/Clothworkers’ Foundation Award 2012/13. Using traditional hand-weaving techniques Catarina designs and makes woven fabrics for scarves, cushions and throws. 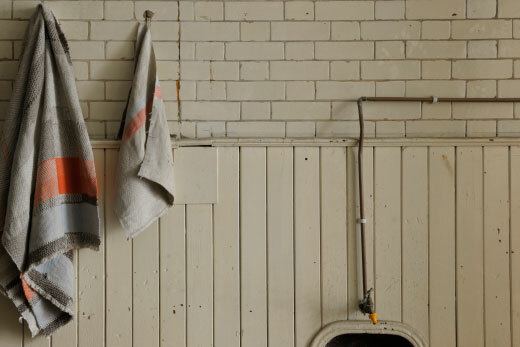 Each piece is made from start to finish in her Deptford studio. 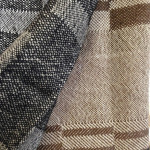 Her distinct aesthetic language is informed by a sound ecological concept based on a strict selection of yarns. Main image photography by Gareth Hacker, courtesy of The New Craftsmen. Catarina only uses linen, hemp, wool and alpaca sourced from the UK and Europe as well as second-hand yarns from donations and her own old stock. Commissions are welcome. For more information please visit her website www.catarinariccabona.com. Catarina’s work can be also be seen at the upcoming Selvedge Spring Fair 4-5th April 2014. This entry was posted on Monday, March 31st, 2014 at 2:41 pm	and is filed under Company Profile, Events, General, New weave developments. You can follow any comments to this entry through the RSS 2.0 feed. You can leave a comment, or trackback.